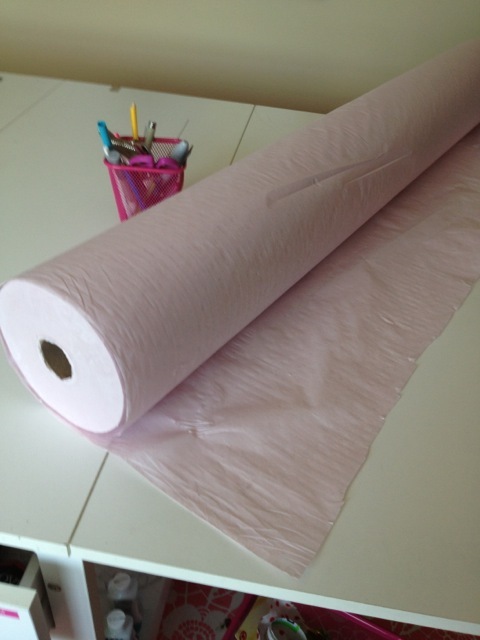 Remember this post, where I wrote about cutting slippery fabrics with tissue paper? Well, I've found a great source for industry-quality tissue paper. I asked the folks at Marist College (where I just finished up teaching a semester long course) where they get theirs, and they pointed me in the direction of South Star Supply Company, a Nashville-based business that provides sewing supplies to the garment industry. (Note: I'd never actually used this kind of tissue, since they had a different, mystery-sourced tissue paper in the studios when I was working at Marist.) South Star Supply also caters to us humble home sewists, making it very easy to place an online order. Their tissue paper is called "High Yield Tissue" and you can order it in widths from 30" to 72". I ordered a roll of 45" tissue, which had 900 feet on the roll, and cost $50 plus shipping. I chose the 45" width because that's the width of most slippery silks that I use. Did I mention it's pink? It's pink! Bonus points for coordinating with my hair and sewing room colors. My only complaint about ordering from South Star Supply is that two of the other items I ordered were out of stock, so they placed my whole order on backorder without telling me. A couple weeks went by, and I contacted the company to see what was going on with my order. They were super responsive and offered to ship out the items they did have in stock (which included the tissue roll). I just wish they'd offered that when I placed the order! If you have an order that's urgent, I would recommend calling them to make sure the items are in stock and ready to ship. 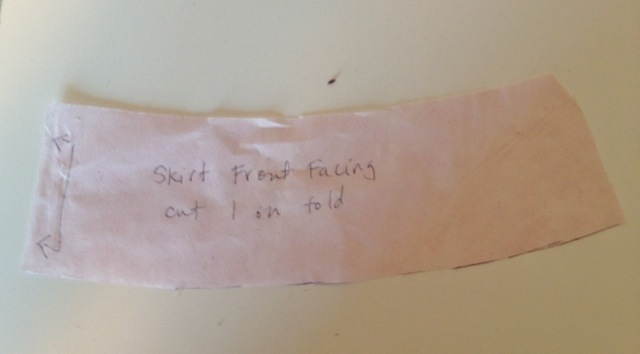 I received the tissue shortly after my email conversation with customer service. When I unwrapped it, I was surprised by how thick it is--not like gift wrap tissue, which tears easily. This stuff is pretty beefy, and it has a coarse texture, which is perfect for preventing fabric slippage while cutting. 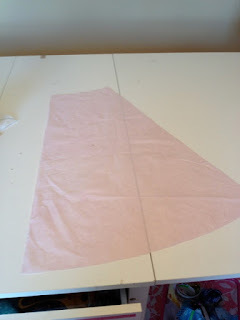 I cut out a dress lining using the tissue, and loved the results. 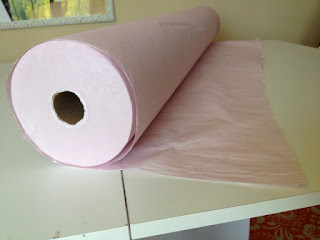 A bonus to this thicker tissue is that you can use the leftovers as pattern paper, making it more economical than the thin tissue, which just gets thrown away. You can even draft facings and other pieces from your leftovers! Here's a skirt piece after cutting. 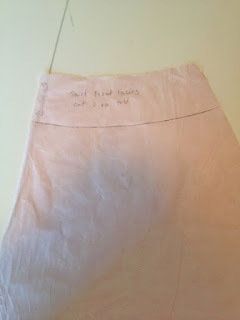 To draft a skirt facing, I just used the top of the tissue to make a 2-5/8" facing piece. Cool, huh? You could also use those extra tissue pieces to make variations on your favorite patterns. Overall, a highly recommended product. If you're looking for thinner tissue paper, Uline carries 36" rolls, which have a whopping 5,200 feet on them. They cost $128, but will obviously last a long time. I think I prefer the South Star Supply stuff, though, since it's wider and has multiple uses. 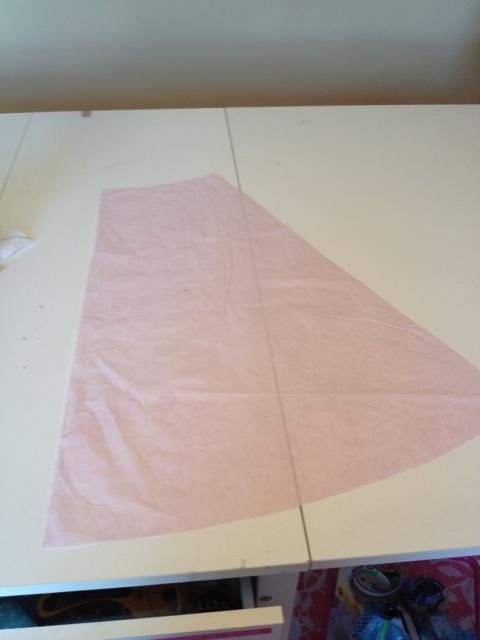 Hi Gertie, Is the South Star tissue thin enough to be used to "tissue fit" a garment using the Palmer/Pletsch method? I have just been searching for tissue paper or something for this purpose so this is really helpful! Thanks! This post came at a perfect time. I was just thinking about finding some good tissue, to work with silk satin. Thank you for sharing! Wait! This is the stuff what I think it is? A little heavier than gift wrapping tissue paper and a little lighter than doctor's office bed wrapping paper? AND it's pink? Another reason Gertie is a superhero. Thanks so much for the supply source, Gertie. It sounds perfect for many things. That tissue paper looks great. Unfortunately South Star has minimum purchase or has a surcharge for orders under $50, so this couldn't be bought on a budget. But what great other items they have....definitely tempting! Just found your wonderful blog, thanks so much for the heads up on the british sewing bee. It is such a fun program and I think Ann is adorable! This is so great, thanks for sharing your tips hey. oooh! might have to get my sis to pick some up (save on shipping) and have my poor kids drag it back to france in their suitcases this summer lol. Oh, I wonder if any of my sewingsista's in the U.K. who also follow you like me, know of a supplier of tissue on a roll, like you are showing?? I have been hunting and researching without any luck. Too expensive to buy from US suppliers due to postal charges and taxes. Aren't you lucky to have so many fabulous resources so close to you. Someone mentioned the cost being high on a budget. Could I suggest that some of your followers could purchase a roll between them, and share it out.............sewingsista's are good at helping each other out and it would be perfect way of getting access to the resources.......just a thought. Love the blog as always. With the phone's 5.0" HD screen, it is quite easy to assume that the handset is on the bulky side. But you are so wrong! The phone is actually light and slim. It is also something that you can easily slip in and out of your pocket. Freelander I30 is made out of plastic but it carries some metallic accents along the phone's side. The impact is nothing but cool. The phone's back side boasts a somewhat smooth texture that will give its user that perfect feel and look. Thank you for this info. I will have to look into buying a roll if I think I can find room for it. I have been using medical exam table paper for years. It is thin enough for tracing, but strong enough for test fittings. I also use it for pattern drafting. The only drawback is the width. It is only 18" wide. I purchased it at a local medical supply store. I can't remember the exact price. I think it was under $10. Ill send you an email too, but I suspect there is someone in my area who copied your latest butterick pattern and is passing it off as "custom designed". Ill email you the details. Having fashion statement along with silk satin looks awesome. Thanks for sharing. I'm planning a summer dress out of silk charmeuse, so this comes just in time. However: How would you transfer markings, like sewing lines and darts, with the tissue paper in place? Let me explain: My fabric is wildly patterned, so I'll cut single layer, pinning the pattern to the right side, so I can see exactly were the pattern goes. So the tissue paper will be underneath, on the wrong side of the fabric. If I want to sew with the tissue paper still in place - which seems to be the point of it - do I mark the tissue paper as if it were the wrong side of the fabric? Any ideas?